Interviews are a scary but necessary part of changing jobs, and they can be especially terrifying if you’re starting in a brand new industry. When preparing for a UX design interview, all the usual “golden rules” apply — like punctuality, a firm handshake and good eye contact. However, employers are also looking for some very specific qualities beyond these basics, so you’ll need to prepare accordingly. In this article, we’ll show you what you can expect from an interview for the position of UX designer. We’ll also share crucial tips and insights so you can go in feeling confident, composed and ready to impress, whether it’s your very first time or you’re a seasoned UX designer looking to change companies. What’s the point of interviews anyway? Before you start prepping for your interview, it can be helpful to think about what an interview actually is; or rather, what is its purpose? In all the nerves and excitement, it’s easy to forget that an interview is not a test that the recruiter wants you to fail. It’s an opportunity; an opportunity to show what you’re capable of and to get to know your potential future employer. On the one hand, you’re there to convince them that you’re right for the job. At the same time, the interview is your chance to suss the company out and decide whether or not you’d be happy working there. Can you do the job? Do you have the necessary skills, strengths and experience to do the job well? Will you love the job? The interviewer wants to know what motivates you, and whether or not this aligns with the nature of both the role and the company. This is important as they don’t want to hire someone who is likely to leave after a few months. Are you a good fit for the company? Aside from your skills, they’ll be trying to figure out if you would work well within the existing team. With these core questions in mind, let’s take a look at how you can prepare for, and ace, your first UX design interview. What can you expect from your first UX Design interview? These days, you can probably expect to have a phone or Skype interview before you get invited for a face-to-face chat. The recruiter or employer wants to narrow down their pool of candidates before proceeding to the next step, so they’ll be curious to know why you applied for the job. The fact that it’s a phone interview can make it seem more casual, but don’t make the mistake of thinking you don’t need to prepare! At this stage, you need to convince the interviewer of your enthusiasm and passion. 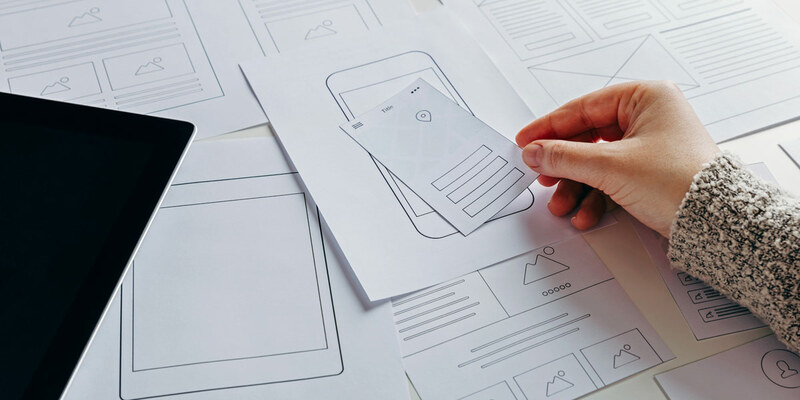 Your pitch should be tailored to the company and the specific role — even if it is one of a hundred UX design jobs you’ve applied for, they don’t need to know that! Research the company and make sure you understand exactly what they do and what they stand for. List your motivations for working for them. Maybe they’re big on sustainability, and this is a value that resonates with you on a personal level. Perhaps they design a certain product that you use and really relate to. Next, study the job description in detail and highlight the tasks and requirements that really stand out. What was it about the job ad that made you think: “I’d be great at this!”? Make sure you’re somewhere quiet! Don’t give the recruiter (or yourself) a bad user experience by making them compete with background noise. Charge your devices beforehand and make sure you’ve got a good connection. If you’re doing a video call, make sure you’re just as well-presented as you would be in person. This means no pyjamas! The same goes for your surroundings. Try to sit against a neutral backdrop, ideally a plain wall. Do plenty of research beforehand and, if necessary, have some notes in front of you in case you lose your thread. Congratulations — you made it past the phone screen and have been invited for a personal interview! So how do you prepare for this next step? Let’s take a look at some common interview questions and what they really mean in a UX design interview. It’s pretty much a given that you’ll be asked this, or something like this, at the start of the interview. It sounds vague enough, but this is not an invitation to tell your life story. It’s an invitation to tell your UX design story. Especially if you are applying for your very first job in UX, the recruiter will want to know how you ended up on this career path. What led you to UX design? What makes you a great UX designer? Tell a relevant, cohesive story that starts with the birth of your passion for UX design and loops back to the role for which you are interviewing. For example: if you were working in customer service before switching to UX, you might talk about how this nurtured your talent for empathy and a user-centric approach. As with your UX design portfolio, there’s no need to include every single detail of your life so far — just focus on those which highlight your suitability for the role. This is the interviewer’s way of asking: are you capable of doing this job? Before you go into the interview, identify your top three strengths that are most applicable to the position. You need to show that you possess the right skillset, but also that you understand why these skills are so important to the role. Look back over the job description. What aspects of the role do you feel most confident about? Maybe you’re renowned for being a genius problem-solver, or perhaps you’ve got a knack for bringing people together and enhancing teamwork. If possible, give real examples to support your claims. This makes your pitch much more convincing, and makes it easier for the recruiter to picture you doing the job! This can be a really tricky question to navigate, especially when you’re trying to sell yourself to a potential employer. Although it’s a bit of a cliché on the surface, avoid cliché answers at all costs! Claiming to be a perfectionist or an over-achiever won’t paint you in a favourable light in the interview room. As a UX designer, you’re required to share your work with others and be open to constant feedback. During the interview, it’s important to demonstrate that you are able to recognize your own shortcomings, learn from your mistakes and use them to move forward. To answer this question, think back to a time in your life — preferably at work — where things didn’t quite go to plan. What could you have done differently? How did you use this lesson to adapt your behavior the next time a similar situation came up? While you do want to be honest, avoid talking about job-specific skills. This could immediately ruin your chances of landing the role, so focus instead on more general examples. When hiring a UX designer, employers are especially interested in one thing: process! They want to understand how you think, how you work, and how you solve problems, so be prepared for some kind of skills-based challenge. Skills-based interview tasks come in all different shapes and sizes. You might be asked to pull out your smartphone and verbally critique an app, or you may be given a design task to take away and work on within a limited timeframe. There is also every possibility that you’ll be asked to perform on the spot. This might sound terrifying, but don’t panic: there’s plenty you can do to prepare! A fairly common UX design interview technique is the whiteboard challenge. You’ll be presented with a problem and asked to design the solution there and then, documenting your entire process on a whiteboard and talking the panel through it as you go. The best way to prepare for a whiteboard challenge (or something similar) is to practice. Get a few friends together, ask them to come up with some design challenges (e.g. redesign the EasyJet app) and have them act as your panel while you tackle the challenge. Remember, the interviewer wants to understand how you work, so practice talking through your decisions and processes as you write on the whiteboard. It can also be really helpful to have a mental template at the ready, such as a list of headings or checkpoints that you want to work through. As soon as you’re confronted with a design challenge, sketch out this template and use it to guide your process in a logical way. Do you understand the target users? What are their goals and needs in relation to the product? What constraints and limitations need to be considered? What would a user journey look like in this context? Are there any other factors to be considered, such as accessibility? Whatever task you’re faced with, remember that the recruiter wants to see your process in action. Don’t take shortcuts just to get to a finished product; show them exactly how and why you make decisions. What should I bring with me to my UX design interview? As part of the UX design interview, you might also be asked to talk through your portfolio. Bring a few printed copies with you, together with your resumé, and be prepared to give a quick presentation of your work. In this case, the interviewer will be interested in the role you played on each project, as well as the approaches and methods you used and the challenges you faced. Aside from that, just make sure you go in with a friendly smile and plenty of (genuine) enthusiasm for the role. Be confident about your skills and the value you can bring to the company, and come prepared with any questions you would like to ask. Remember, it’s a two-way street, and asking questions shows that you’re truly interested. Ready to embark on a new career? Here are 5 ways to prepare for a major career change.